I've read almost as many marketing books as ones on horse racing, and one anecdote from one of those books stood out. It was about cheese. People love cheese. If you and I were a monopoly cheese maker we could make blocks of cheddar and we'd be rich. But if we wanted to be more rich, we'd create many more cheese's and we'd package them in many ways. Monteray Jack, singles, swiss, cheese strings, feta, pre-shredded, liquid for dipping and 1000 others if we could. 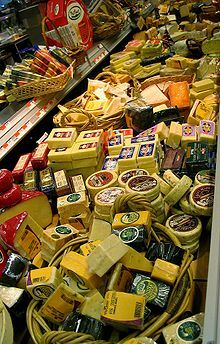 We'd also have information websites and recipes with ways to use all these glorious cheeses. Consumers want cheese, but they also want many flavors, sizes, and ways to use it. It's a world of cheese. At the Horseplayers Association of North America, survey after survey have asked for better field size, better pool size and more information. The HANA Racetrack ratings make two of those components paramount to the fundamentals of wagering, and the racetrack rankings. It's all about cheese. The Kentucky Derby is a prime example of this, and we see it each and every day. With twenty entrants, bettors are given choice. With twenty entrants and a world of social media, health reports, press conferences, clocker reports, video and free past performances at places like Brisnet, there are hundreds of ways, and thousands upon thousands of reasons to like one of those twenty horses. With a pool size where you know a $50 bet on one of them won't knock them down in the odds, or the odds won't change after the bell, you have yourselves a bettor's dream. It's a world of cheese, with many flavors, distinct packaging, and it tastes good, too. You might be saying "Pocket, you're crazy. The Derby is the Derby for gosh sakes. You can't replicate it." Maybe not, but the fundamentals of cheese selling are the fundamentals of increasing gross demand for a product. At the Meadowlands this winter, we've seen these things in play, not on a Kentucky Derby scale of course, but with those same fundamentals. Field size has been issue number one. Their field size has increased and this is planned right from the race office to the horsemen. Did you know this year for a stakes race they got only six entries. Guess what? They didn't card the race. They put the money somewhere else, where they would get more horses instead. They wanted losta choice, through lotsa cheese. Pool size is paramount, so they offered lower rakes to many, hoping they'd bet more. Information on how to bet and what to bet is important, so they took a page out of Hong Kong, and started reporting stale date horses, and the reason for the stale date. Trainers have been more than willing to give out this information when they enter, and it has so far been a good idea. They're going the extra mile to give information on how to turn one of their cheese choices into something pretty tasty. These things are done without slots, in a locale which has slot tracks giving away much more purse money within a one hour drive. Compare this to what many other tracks are doing: Carding short field races, not being imaginative in any way, writing races for horsemen, not the end user, and throwing their hands up in the air saying they can't do anything. They need to find ways to be more like the Derby, to make different and differently packaged cheese, just like the Meadowlands has done. You don't have to be the Kentucky Derby, to learn from the Kentucky Derby. Carding races with lots of choice and giving out information on those choices should not be a one off concept. It's something that needs to be done every day. The Meadowlands is not run by horsepeople as such the Head Cheese is able to develop a customer driven model.....it seems so simple. No mold on Mr Gural!